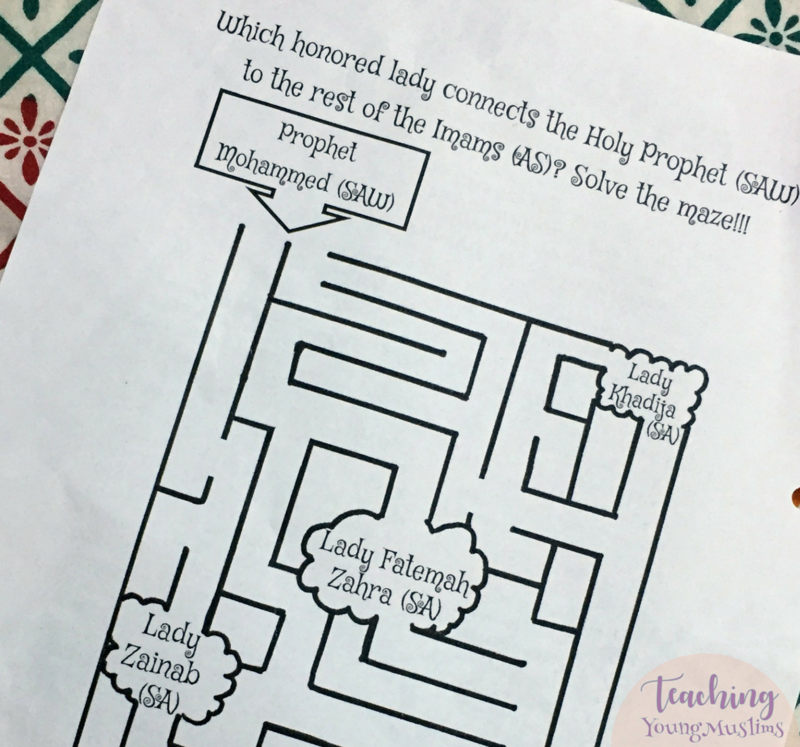 We are continuing our focus on Bibi Fatemah Zahra (SA) today, with a maze. We love mazes! Especially putting them in a clear pocket so they can be used over and over and over (and over!) again with dry erase crayons/markers. The enemies of Islam used to make fun of the Prophet (SAW) for having no sons. In Surah Kawthar, Allah (SWT) tells the Prophet (SAW) that he will be blessed with many descendents, while his enemies will be “abtar,” cut off from posterity. The person who continues the progeny of Prophet Mohammed (SAW) is Bibi Fatemah Zahra (SA), his daughter. She is the person who connects Prophet Mohammed (SAW) to the rest of the Imams (AS). To illustrate this, we have a maze, a puzzle in which we must find a way from Prophet Mohammed (SAW) to the Imams (AS) to figure out who connects them. TO DOWNLOAD: there are two versions of this maze: in the first version, the maze has only one way through, so it is a little bit easier. The second version has several ways through the maze, but in order to choose the correct path, we must know the correct answer to the question. InshaAllah you will find this an effective and helpful illustration! Another activity I loved to visualize this concept is here by Islam from the Start. What other activities have you all used to creatively illustrate Surah Kawthar? I would love to hear! Let me know in the comments section below!